Year You Were Born Book and DVD Gift for Years 1930-1981. For the senior who has everything, this gift is a nostalgic reminder of what happened the year they were born or they got married. 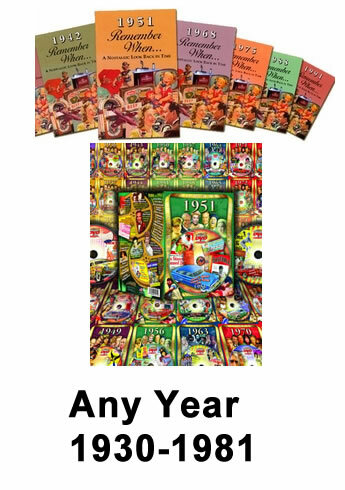 We offer both a year trivia book and a year DVD at a special sale price. Our 30 minute year DVD shows you the top events from the year, some of the most common prices for staples like bread, milk, average salary, the most popular sports events like World Series and Super Bowl, top song clips, and film clips. The softcover year booklet is in color and has 24 pages of advertisements, a few prices, what happened that year, and other entertaining trivia. We have priced this as a special value price gift- ideal for your senior friend as a birthday gift idea or for an older couple celebrating their wedding anniversary.